ISTANBUL — Riot police fired tear gas, water cannon and rubber bullets in day-long clashes that lasted into the early hours Wednesday, battling protesters who have been occupying Istanbul's central Taksim Square and its adjacent Gezi Park in the country's most severe anti-government protests in decades. The crisis has left Prime Minister Recep Tayyip Erdogan looking vulnerable for the first time in his decade in power and has threatened to tarnish the international image of Turkey, a Muslim majority country with a strongly secular tradition, a burgeoning economy and close ties with the United States. Throughout the protests, Erdogan has maintained a defiant tone, insisting he would not be bowed by what he described as a vocal minority. On Tuesday, as police clashed with protesters in Taksim, he insisted again that the unrest was part of a conspiracy against his government. The demonstrators, he said, " are being used by some financial institutions, the interest rate lobby and media groups to (harm) Turkey's economy and (scare away) investments." A peaceful demonstration against the park's redevelopment that began more than two weeks ago has grown into the biggest test of Erdogan's authority, sparked by outrage over a violent police crackdown on May 31 against a peaceful sit-in in the park. The unrest has spread to 78 cities across the country, with protesters championing their objections to what they say is the prime minister's increasingly authoritarian style and his perceived attempts to impose a religious and conservative lifestyle on a country with secular laws – charges he rejects. 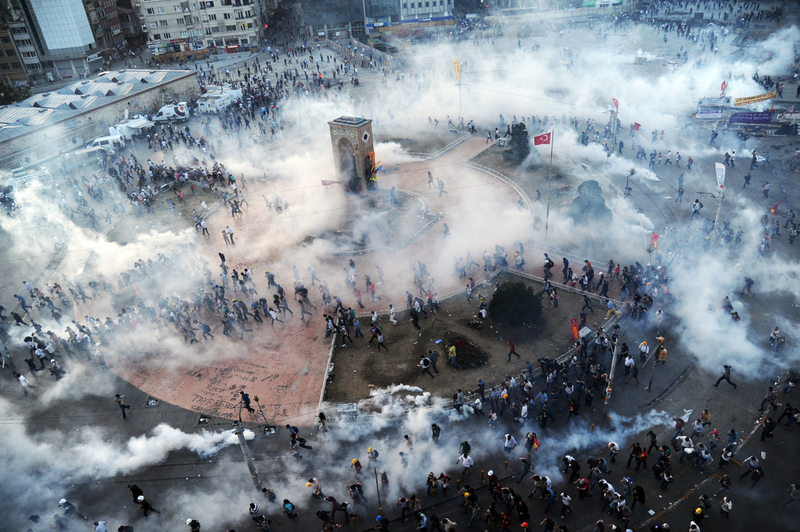 Four people have been killed, including a policeman, and about 5,000 have been treated for injuries or the effects of tear gas, according to the Turkish Human Rights Foundation. Thousands of police moved in early Tuesday, pushing past improvised barricades set up by the protesters who have swarmed through the massive square and park in the tens of thousands for the past 12 days. Police fired repeated rounds of tear gas that rose in stinging plumes of acrid smoke from the square in running battles with groups of protesters hurling fireworks, bottles, rocks and firebombs in a cat-and-mouse game that lasted through the day and into the night. More than 30,000 converged on the square again as dusk fell and were repelled by water cannon, rubber bullets and tear gas after Istanbul's governor, Huseyin Avni Mutlu, said the police came under attack from "marginal groups." By the early hours of Wednesday, cleanup crews had moved into Taksim Square, clearing the debris and dismantling the makeshift shelters the protesters had set up. Protesters set up barricades of metal railings and smashed vehicles at the edge of the square leading into Gezi Park, where hundreds returned despite repeated rounds of tear gas being fired into their midst. Fearing injury, many protesters scrawled their blood type on their forearms with marker pens. The area reverberated with the echoes of exploding tear gas canisters into the night, while volunteers ferried the injured to waiting ambulances. Gezi Park, with its thousands of camped-out demonstrators young and old, has become the symbol of the protests. Both the governor and the police initially promised that only Taksim Square would be cleared, not the park. But late into the night, the governor indicated a more muscular police sweep was imminent. "We will open the square when everything normalizes in the area, and our security forces completely control the area," Mutlu told A Haber news channel. "Our children who stay at Gezi Park are at risk, because we will clean the area of the marginal groups," he said, referring to what the government has said are troublemakers among the protesters. "We won't allow our government to be seen as weak." In the capital, Ankara, police fired water cannon and tear gas to disperse several hundred protesters – some throwing stones – who gathered in sympathy with their Istanbul counterparts. In the early hours of Wednesday, police moved in to Kugulu Park where protesters had been camping. They made dozens of protesters pack up their tents, and arguments broke out with those unwilling to move. Tuesday's clashes came a day after Taksim saw its smallest gathering since the demonstrations began. The government had said Erdogan would meet with some of those occupying the park on Wednesday to hear their views. Erdogan, a devout Muslim, says he is committed to Turkey's secular laws and denies charges of an authoritarian manner. As he defended his tough stance, he gave critics little hope of a shift in his position. "Were we supposed to kneel before them and say, `Please remove your pieces of rags?'" he asked, referring to the dozens of banners and flags the protesters had festooned in the square. "They can call me harsh, but this Tayyip Erdogan won't change." Confident of his position of power after winning the last elections in 2011 with 50 percent of the vote, Erdogan has insisted he will prevail. He made it clear that he has come to the end of his patience with the protesters, whom he accused of sullying Turkey's image abroad and being vandals and troublemakers. "To those who ... are at Taksim and elsewhere taking part in the demonstrations with sincere feelings: I call on you to leave those places and to end these incidents and I send you my love. But for those who want to continue with the incidents I say: `It's over.' As of now we have no tolerance for them." "Not only will we end the actions, we will be at the necks of the provocateurs and terrorists, and no one will get away with it," he added. Huffington Post, Susan Fraser, Jamey Keaten and Ezgi Akin contributed from Ankara, Turkey.